Brazil attracts thousands of tourists to the world famous beaches, warm sea, fresh coffee, magnificent waterfalls and, of course, spectacular carnivals. A trip to this country – not the cheap pleasure, but the attractions of Brazil deserve to see them. The ideal solution for the traveler – rent a car, which can be freely used to explore all the interesting places and just travel around the state. 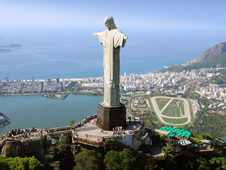 The site bookingcar.ru can arrange car rental in one of the airports in Brazil. You can choose the most suitable means of transport and access to it upon arrival at the airport. Also rentals are located near the hotel. The new penalty system used in Brazil since 2009. Drivers who violate traffic rules burly, can be punished by a monetary or imprisonment. Also awarded penalty points - when their number reaches the maximum limit, the driver is deprived of rights and forced to receive them again. Inspectors on Brazilian roads are rare - the movement of drivers and watch special cameras and radars. Renting a car in Brazil you must be prepared for the fact that the local drivers often do not follow the traffic rules, and go to overtake, despite the red light. On highways, the highway may be common movement at a speed of 120 km / h, but no more. Drivers are advised to be very careful because of the use of active radar tracking. Parking: you need to know at Car Transport in Brazil? With a parking spot in Brazil - the problem - there is an acute shortage of them. Local drivers often leave vehicles at its discretion: cluttering the central part of the road, "propping up" other machines, etc. Offices and organizations with their own parking. Many parking lots are located underground. In areas with a sign in the form of a crossed out the letter "E" to park the car is prohibited. If the parking lot is marked with «azul», it means it is only for owners of special cards. 1:00 in a remote area - 2-3 USD. In large parking areas working staff that finds a place, bring a check to pay the driver, but not responsible for the safety of the vehicle. 1 liter of diesel fuel costs about 2 USD. Typically, in countries with a high level of fuel prices higher, while the country's less developed or engaged in oil export prices are low. On the territory of the present toll roads that are under private management. They formed an ambiguous attitude, because the cost of travel on toll road is high enough. For example, the driver will have to spend about $ 60 to go from Rio de Janeiro to Sao Paulo. As for benefits, the toll road is always qualitative, they are called "green." During my business trips to other countries I travel a lot. Car rental has become an excellent solution for me. Since it is not always possible to rent a car quickly at the place of destination, I rent a car online. I\'ve tested many sites. Most of all I like bookingcar. The site always works good. There is a lot of options from a wide variety of providers. It\'s everything I need.